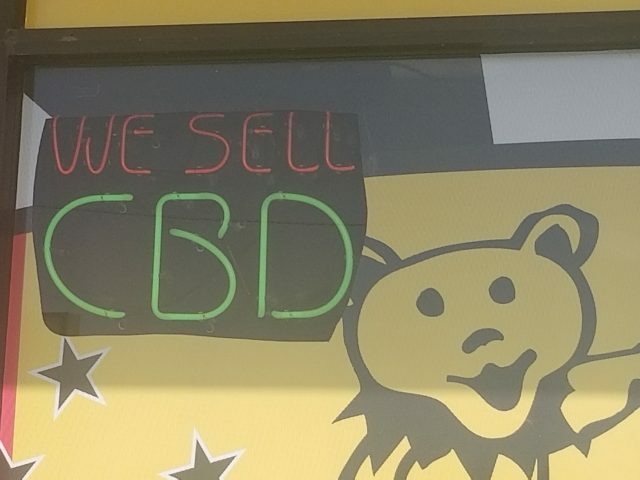 Light up sign in the window of Rocketman, a shop in Sarasota’s Gulf Gate area, advertising its CBD sale. 2018 has been a hallmark year for Cannabidiol (CBD) products. CBD is one of the over 100 chemicals in cannabis, according to USA Today. Due to the fact that CBD sale and use is legal in Florida, accessible and can be used for anxiety management or pain relief, it has caught fire this year. In response to growing demand, many Florida smoke shops have stocked up on a wide variety of CBD products including gummies, lollipops, oils for under the tongue, topical creams, chocolates, vaporizer (vape) cartridges and in some stores, CBD buds. Good Timez has several locations in Tampa, Florida. A New York Times article published on Oct. 27, 2018 titled “Why is CBD everywhere?” unpacked the chemical’s recent rise in popularity and tackled its many uses. Williams went on to discuss the reasons that people have gravitated towards this now Food and Drug Administration (FDA) approved solution, and they ranged from anxiety to hangovers to Parkinson’s and even cancer-related relief. While skeptics are not entirely correct in their skepticism, Williams reported that research on CBD’s benefits “is still in its infancy,” but so far it looks promising. Most of what Lane hears on the job is customers’ hopes that it will relieve muscle and joint pains or stress and anxiety. “Basically you get all of the benefits [of cannabis] without the intoxication or mental effect,” Lane said. Although CBD use does not cause mental impairment, some describe a “body high” from use of CBD products. “It gives me a calming feeling and I can actually lay down feeling relaxed without a million things going through my head,” Sarasota resident Theresa McCutcheon said of CBD. McCutcheon regularly deals with stress, insomnia and chronic joint pain. “I haven’t really noticed it helping with pain but it does help me sleep better,” McCutcheon said. According to Statistica, CBD sales in the U.S. increased from $358.4 million in 2017 to $512.7 million in 2018, and they are projected to hit $1.15 billion by 2020. As Williams pointed out, the future will also likely hold increases in scientific studies and understandings of applications for the chemical. Information for this article was gathered from usatoday.com, nytimes.com, forbes.com, statistica.com and aarp.com.